Status: offline I've returned to play PACWAR after a very long time, and was relearning some things. Am I missing something not stated in the manual or in the patch notes? I've been looking around all docs I could find and this forum, but not much was found. Status: offline Like much else in the game, this feature is probably broken. Don't get me wrong, I love pacwar and I think it's a classic, but it's also a bit of a mess internally and hasn't been actively worked on for more than 20 years. I have to say though, I wish WitP was closer to this level of playability. I own WitpAE, but find it irritating beyond belief due to the UI. It simply should not be so difficult to e.g. order some ships to go somewhere and load a unit onto them, at the grand strategic scale. Armed forces have staffs for this sort of thing--much less unreasonable in pacwar. As Allies I wouldn't worry too much about the alleged range of your SS, base them pretty much anywhere safe and stick em around the main convoy areas, and you'll clean up mucho shipping. Coastal SS are fairly useless for both sides AFAICT (soon spotted and attacked and/or neutralised usually), but the ocean going SS for both are reasonably effective--Allies extremely so from mid 1943 or so, JA decreasingly so from that time, which is reasonable. hasn't been actively worked on for more than 20 years. Did you check this thread? It contains a link to our website, 'Pacific War Update'. The site has moved to another platform recently and has a new address. Otherwise, everything else is mostly unchanged. Progress has been quite slow since last year, but it's there. Status: offline Thank you. So it's not a somewhat obscure mechanic but a bug. Status: online ..apart from waiting for IstFemer to "vaporize" that annoying Sub-Bug.. Status: offline Yes, as Istfemer mentions, we're still working on this. I've been working on the EXE quite heavily the last month. This little burst of interest inspired me to look for the submarine patrol range bug. After a bit of head banging, I was able to find and fix it. It's actually in 2 different places, same bug, from the original game version. 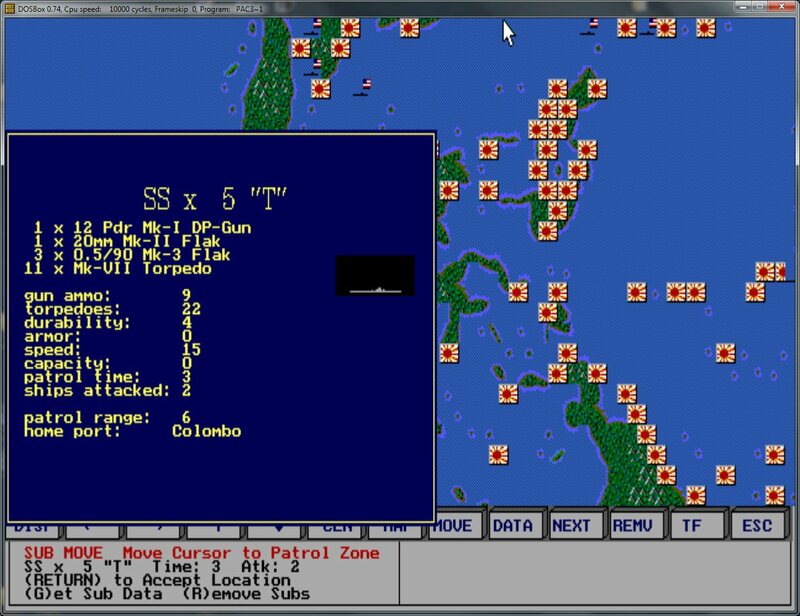 In loading the submarines home port, the code takes the home port byte and converts it to a 2-byte word using the assembly statement "cbw". This works as long as the base number is below 123, if not, it converts into a negative number which screws up the retrieval of the port X and Y coordinates. This is why the distance looks OK some of time, other times way off. I was able to change the code to mov ah, 0; and voila, all fixed! Now, how to get this latest version to you guys. The version I have will probably only work with the OBC41 file, which I've modified, and it's still a work in progress. But it would be nice to get something out so you could see the latest developments. I'll see if I can put something together for this weekend. Status: offline That's great news.